OSEA Emerging Scholars Research Conference. Ethnography of Yucatan, Maya Ethnography, Advanced Seminar in Anthropology. Tourism in the Maya world, Tourism Development, Ecotourism. Anthropology of Tourism, Tourism Working Group, Maya Riviera, Cancun, Playa del Carmen, Field Study Abroad, Mexico, Spanish Language School, Intensive Spanish Course, Maya language immersion, Second Language Acquisition, Teaching English Service Learning, Participatory Action Research, Community Action Research, Indigenous Politics, Heritage, World Heritage, Seven Wonders of the World, New Seven Wonders of the World, UNESCO Heritage, Mexico World Heritage, Latin American Anthropology, Quetzil Castaneda, Juan Castillo Cocom, Ronda Brulotte, Maya civilization, Maya calendar, Maya 2012, New Age Prophecy, Chichen Itza, Ek Balam, Valladolid, Merida, Yucatan, Quintana Roo, Universidad Intercultural, Maya revitalization, tourism impact, impact of tourism, ecotourism, sustainability, globalization. OSEA The Open School of Ethnography and Anthropology: Ethnography of the Future / Interdisciplinary Cultural Anthropology / Study Abroad. Student Ethnography projects, ethnographic methods courses, field study abroad, ethnographic field school, archaeolgoy of ethnography, ethnographic archaeology, Maya culture, maya Riviera, Maya cilization, Yucatan, Mexico, Cancun, Tulum, Playa del Carmen, Maya Cruzob, Maya Language, Spanish schools in Mexico, anthropology, cultural anthropology, interdisciplinary anthropology, Emerging Scholars, new research, tourism conference, tourism studies, anthropology of tourism, Wenner Gren Workshop, Lynn Meskell, Mark Leone, Ann Pyburn, Lisa Breglia, Hugo Benavidea, Jeff Himpele, Richard Handler, Christopher Matthews. 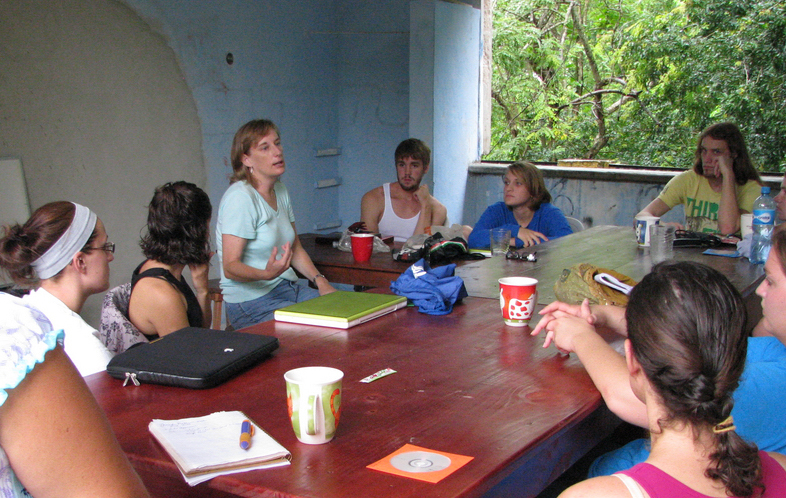 OSEA has become recognized as a leading center of anthropological research and ethnographic training in the Yucatán. OSEA offers researchers who work in Yucatán and neighboring states of Quintana Roo a field center to visit, meet with other field researchers to discuss projects, to consult resources, and to participate in ongoing dialogue on current issues. As part of its ongoing mission OSEA organizes and sponsors a series of distinct research conferences and workshops. The Emerging Scholars Research Seminar is an annual conference inaugurated in 2011. The objective is to provide new scholars the unique opportunity to engage in an intensive and focused dialogue with their peers on shared research questions and interests. The OSEA ESRS is designed on the model of an SAR Research Seminar(School for Advanced Research) but for emerging scholars -- that is, persons ranging in career status from advanced graduate students who have completed significant field research to recent Ph.D.s who have yet to publish their first book. The seminar is designed to stimulate critical and constructive commentaries that can lead to new and significant insights into the work of each participant and into the issues that are addressed. The constructive-critical dialogue is designed to lead to the publication of articles based on papers presented in the Seminar. To this end papers are circulated in advance and each participant is designated as commentator on a specific paper. As part of each ethnography field school program, student researchers participate in an in-house OSEA Conference. These conferences are structured as professional meetings in which students are provided 15 minutes to give a presentation of their research project and fieldwork. Often these are attended by friends from the community who have worked with student researchers in the course of fieldwork, homestay parents, community friends and colleagues, as well as invited scholars and researchers who are working in the area or passing through on the way to/from their research sites. In 2005, OSEA was host sponsor of a Wenner Gren Workshop on Social Archaeologies. This workshop led to the publication of the book edited by Quetzil Castañeda and Christopher Matthews, Ethnographic Archaeologies, which has become recognized as a pioneering text in the development of this new subfield of archaoelogy.